Sorry for the panic. but I need to have this trailer on the road by Friday morning (5 days from now). The axles appear to be original (I can confirm with the previous owner). The backing plates are welded to the axle tube, making it a real PITA to get the right brake parts ... can't redo the brake the easy way (unbolt old backing plate, bolt on new backing plate with all new brakes parts). A friend is helping me with this. The new brake parts arrived and we were going to simply swap over the new parts, but that is proving to be more difficult as things are not an exact match. We ordered parts for a Dexter 3500# axle. My friend quickly looked and could not find any easily identifiable marking on the axles so we could order the correct parts. Any idea what axle might be under my TT so I can get the right parts ordered? What would be the correct axle weight rating? 3500/4500/5500??? would I be better off swapping out the whole axle, so I could get the easy solutions and simply bolt on what I already have? UUGH ... I added them to a new album for my account ... I will post this for now and add the picture after I figure out how to link the album to this thread. The new brake parts arrived and we were going to simply swap over the new parts, but that is proving to be more difficult as things are not an exact match. We ordered parts for a Dexter 3500# axle. I will try and help, hopefully this can get you going. Options, all different time tables. 1. If your magnets are still all good, see if there is an automotive brake relining place in your area. They can bond new brake material to your exiting shoes. 2. New axle tubes may not be in your timeline. Many are made to order quickly from premade parts. They cut the tube and weld the spindles on and ship it. Unless you just happened to have an standard exact size where the spring seats where welded on axle tube to match your camper and the brake drum face distance was standard on your camper, odds are high this might be a full week to ship under a rush to make new axle tubes. It is for sure a doable option, but may not fit your timeline. 3. I might have got lucky and identified your axle and brakes. This pic of yours is not a Dexter 3,500# brake. I can tell by the springs holding the shoes on at the top. First is, I do think you have a 3,500# axle tube. The next size down is 2,200# and there is bearing differences. The Alko 3,500# axle (and Dexter too) has a inner bearing bore of 1 3/8" with the outer bore of 1 1/16" dia. Check the spindle diameters on your axle where the 2 bearings go on. An Alko 2,200# axle does not have 2 steps diameters. The inner and outer are 1 1/16" dia spindles. on page 6 it looks like yours with the exception of the magnet shape which may have been updated since 1988. Page 20 has the bearing diameters for axle sizes. Page 37 & 38 has the parts call out on 10" dia x 1 3/4" wide brake parts. Page 39 & 40 has the parts call out on 10" dia x 2 1/4" wide brake parts. This is the new Alko web site. Not as good with pics as the older Alko website AL-KO They were sold to Dexter for the US market a while back. 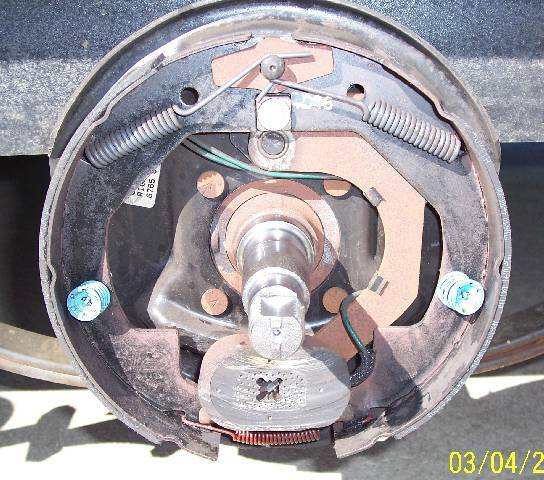 Confirm please, is your brake drum a nominal 10" diameter where the brake shoes ride? Is the brake shoes 1 3/4" wide or 2 1/4" wide? Sunline might have used 2,200# axles and 1,100# springs. This would be 4,400# of running gear against the 1988 brochure GVWR of a T-2263 of 4,480#. And they might have used a 3,500# axle tube with derated springs of 1,250# each x 4 springs = 5,000#. Do not really know but by confirming the bearing spindle/bearing bore sizes and the brake drum diameters this will really help narrow down the brake sizes. You may also have a Hayes Axle as Sunline did use some of them long ago. The handle Dexter, Alko and Hayes axles. They are right down the street from the Alko factory if that Alko factory is still open. These folks know Alko. They greatly helped me when I had to buy 2 Alko new axle tubes for my T310SR and they had in stock any Alko brake part I ever wanted. Sending them your pics and the new info I talked about they may be able to back into what you need. Getting the right parts as fast as possible may be your only chance for Friday. This is all good stuff. For now, I have the rear axle removed with the springs still attached. I plan to make a few calls tomorrow and take the whole thing to a local shop so they can get any measurements needed. If I can get a pair of stripped dexter 3500# axle that will simply bolt up, then that’s what I’ll do. So much simpler to unbolt the backing plate, cut the magnet wires, bolt a new plate in, resplice the magnet wires, pack the bearings, adjust and go. The loaded backing plates I bought are for a 3500# dexter and look exactly like what you have pictured - even the oval shaped magnets (mine are round). If I can get an axle tube and spindle to match locally, that’s what I’ll do. My fallback plan is sourcing the correct shoes and spring kit and putting it back together. My original shoes measure 1.5” and the drum is 10” inside diameter, which almost match the infor you have stated about the Alko axles. The spindles definitely step down in diameter, so different sized inner and outer bearings. Doing more searching, basically it looks like the 10” x 1-3/4” drum seems to be made out of unobtainium ... there are no referenced parts numbers ; for both Alko and Hayes axles, every one of them has “ - - - “ for the cross referenced Dexter part #. I’m still crossing my fingers that I will get lucky and score a set of Dexter 3500# axles locally (S NJ / Philadelphia area). BTW, my Sunny is the GOTA station for my club’s Field Day setup. I hope to be able to take the trailer there Friday morning. It’s only about 10 miles, one way. If you are taking the "whole" axle to a shop to try and match it up, make sure you take both brake drums, bearings and the axle nuts and washers. Even if the bearings are wiped clean with grease they can help. Axle seat to axle seat left to right. And since your axles are centered on the trailer, they need the distance from the drum hub face to the axle seat. If you have the 10 x 1 3/4 setup, and this is Alko it could be the brakes are sized for 3,000# per axle. I cannot find that in their manuals right now but that is highly likely. Dexter also makes a 10 x 1 1/2" brake set that is 3,000# rated. The Dexter 3,500# brake set you bought, they would (should) be 10" x 2 1/4" wide brakes. If that is what you bought, they will not fit with the drums you have as they are not wide enough. If you are getting a new axle, then you will need to get new 10 x 2 1/4" drums to use the 3,500# brakes. They may have a complete brake axle which is axle tube, drum and brakes already mounted. It may come with spring too. It may need to have a fresh grease repack as new axles can be real light on grease sometimes. If you only get the axle tube, get new U bolts if you are reusing your old springs. 1988 U bolts may have to be cut off the rust is so bad. 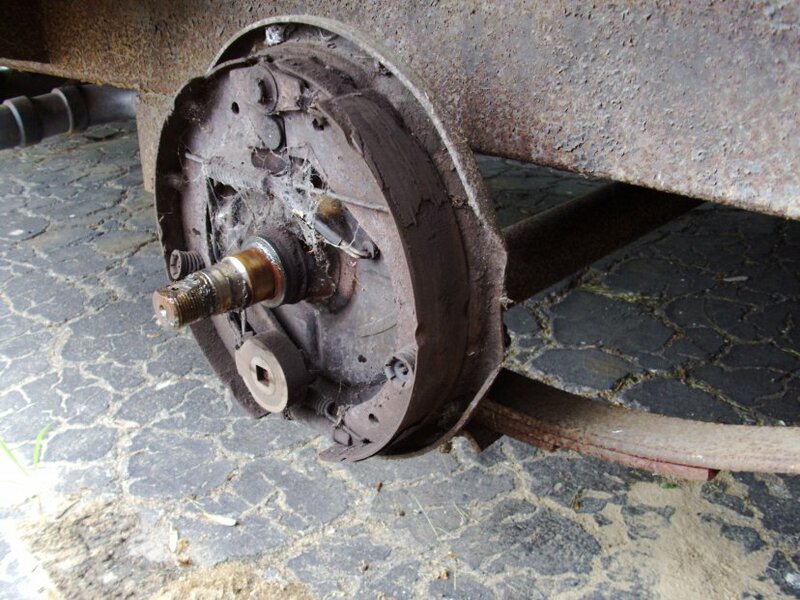 Another heads up, on drum brakes, when new shoes are added, or an all new axle brake etc., new brake shoes need to be burnished in once you get everything all together. Hope this helps and let us know how you make out. They are very likely Kelsey Hayes brakes, those were pretty much the standard on Sunlines all throughout the '80s. The only parts I know to be available for them now are magnets- shoes, backing plates, and drums are long obsolete and hard to find. Yup. I've spent alot of time on the phone this morning, including to Dexter. Dexter said if these are truly ALKO axles @ 10" x 1-3/4", they no longer make or stock parts for them. The best I could hope for is finding NOS at a dealer that has hoarded them. Since I have brand new loaded backing plates, drums and bearings for a 3500# Dexter axle, I just need to find the tubes locally. I found a place in Delaware (Dexter authorized dealer) that has appropriate tubes in stock that would fit (I'm approximately 83.5" hub face to hub face), but I would need to find a welder who can weld the spring perches on the tubes for me. The good news is, the measurement for my spring perches is "the RV standard" according to Dexter @ 68-3/8 (they say the standard is 68.5"). Now to find the time to get down to DE before they close. There is another local dealer, much closer to me that has the axle tubes in stock, but they want almost double what the place in DE wants .... time to answer the good 'ol fashion question, what is worth more, time or money??? The best I could hope for is finding NOS at a dealer that has hoarded them. That would be quite lucky, but this has come up a fair amount in the past, and I haven't heard of anyone who was lucky enough to find any NOS Hayes brake parts. The parts were all NLA in 2004 when I had my '86, so they've been gone for a while. Just curious, I know you're a bit deep to turn back now, but why the concern about them for a ten mile trip? The brakes shoes on the front axle are gone - no material left. The last time I used this trailer was the same weekend last year (I bought the trailer May 2017). On last year's trip, I had a panic stop and no working brakes that pushed me into the intersection - no collision, but gave me a good scare. I want to have functional brakes this year. So, I opened pandora's box ... the rest is history. Wow! Then yeah, I definitely don't blame you for wanting them operational. That's worth the drive to DE, or spending more $$. I’m at the local trailer place; they have a deal with 2 complete axles, springs, etc. for $705 + $10 per perch welding; basically $800-ish out the door. I should have them on my utility trailer within the hour. At least it will be easy to service them and get parts to keep my Sunny on the road. I’m having the perches welded to the other side of the tube, preparing to flip them (mount the tube below the springs) and give me an extra 2.5”, which will make it easier to level it out with my lifted tow vehicle (‘95 bronco, 4” lift + 35” tires). Sounds like a plan coming together, let us know how this comes out and a few pics would be good too. New axles are in ... next up is splicing in and adjusting the brakes + installing the new, fully charged battery. New tires and wheels are scheduled to arrive tomorrow. Almost there. I’m on track for my short trip on Friday. Assuming there are axles installed behind the dumpster, looks good!